Memories of an evening with Oprah circa 2013. AHA moments – Who are you in the moments of quiet and stillness? Listen carefully to the whispers and um’s. Listen to your inner voice, follow your instincts and find greatness in service. “Focus on what you have and you will always have more” ~ Oprah. 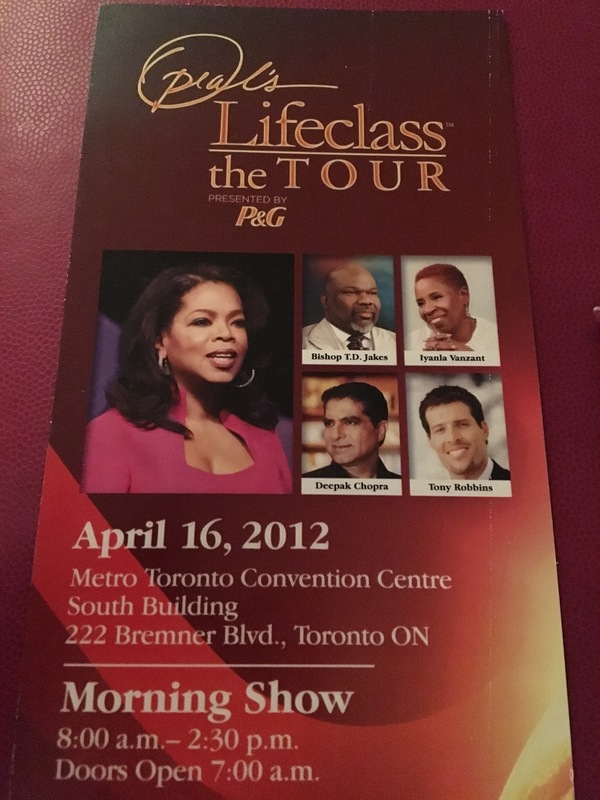 Five years ago today, my sister-in-law and I saw Oprah live when she brought her Lifeclass to Toronto, Canada. As a lifelong Oprah fan, this was a dream come true. Only when Lifeclass began did we know that the theme would be gratitude. I knew immediately we were meant to be there. I reflected back on my notes from the Lifeclass on Gratitude and share a bit of my food for thought with you. * Gratitude Journal – What five things are you thankful for everyday. Power in the words. * Change your state of being and start to be grateful. * You see your life as a gift. Look for the blessing. * Gratitude – you can change your contentious. If you are thankful for what you have, you will always have more. Life in the present. Embrace the now. * PAIN – Iyanza Vazant – Pay Attention Inward. Get grateful in all paths along life. Each stop will teach us along the way. Pay attention to how we respond to the stop. * Gratitude – We cannot be grateful and hateful simontanously. * Gratitude can be a lifesaver when you do not have anything else. * Everyone’s story is either an absolutely warning or an example. * Saint and sinner exchanging notes. Use our keys to open up our prisons and to do something great to escape. Who you are matters and gives people HOPE. * All is a gift. Hope you can leave here and rethink how you see your life. * Whatever I seed will grow. * Your inner vision makes your special. * Always remember everything connects to gratitude. Grateful I had the opportunity to enjoy this special day and thankful it has kept me focused on finding gratitude in the simple joys of life.